So, after weeks of recruitment and being up to your eyeballs in resumes from candidates that clearly never read the selection criteria in the job ad (I mean I’m really sorry Apollo Rocket Jones but your excellent experience as a hamburgerologist doesn’t qualify you to be an Actuary…) you’ve finally filled the vacancy in your team with the perfect person. Dusting off your hands, you smugly smile and think: no more working overtime; no more angry clients due to staff shortages; and now you don’t have to tell Jenny she can’t go on her honeymoon because she is needed at work. We know that the first 45 days is a make or break period for your new team member. As many as 20% of staff won’t make it past this point for a number of reasons. Some candidates get “a better offer” and don’t even make it to day one. Others leave because they feel overwhelmed without adequate training and support to make a successful transition. And then there are those new hires that resign because they feel unwelcome and/or isolated and struggle to develop relationships with their new colleagues. The best way to welcome your new team member and make them feel a part of the team is with a unique and inspiring employee induction kit. Induction kits have come a long way in the last ten years. No longer are they just a big boring bundle of forms to fill in. 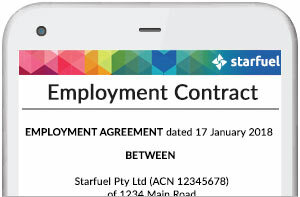 The modern version uses technology to deliver a highly interactive induction experience straight to the team member’s smart device – often days or week before they even commence work. The induction kit is an opportunity to roll out the metaphorical red carpet and charm the socks off your new team member. In addition to the essential forms and documents, it can contain links to useful websites and blogs, access to company social media sites, and entertaining videos that describe and introduce your firm. You really are only limited by your imagination. Brand everything. Work with your marketing department to create a style guide and put your logo on all of the materials. Remind your new team member that they have joined a business they can be proud to work for. When people care about and believe in the brand, they’re motivated to work harder and their loyalty to your company increases. Think of the induction kit as internal marketing for employees. Like other marketing, you need to research and understand your target audience before you spend valuable time and resources on developing content or methods for delivering key messages. The last thing you want to do is make your new staff feel like a number. Develop an induction kit that you can personalise based on what you know about your new employee – their personal details, career history, experience and expertise, accomplishments, and interests. Every time a staff member comes into a new environment or joins a new team they go through a period of adjustment. Many of the workers listed above won’t require the same documentation and information that new permanent employees do, but you will still want to make sure they are set up for success and welcomed into your business. Find out what your are missing beyond the staff induction kit. Useful free resources for inductions and onboarding. Comes with induction kit templates ready to use.